For the last several years, I have worked toward outlining the intentions of Third Leap Brewing & Blending. Over that time, these intentions have evolved from motto to mission statement to (finally) manifesto. The Third Leap Manifesto embodies where we began and what drives us forward. 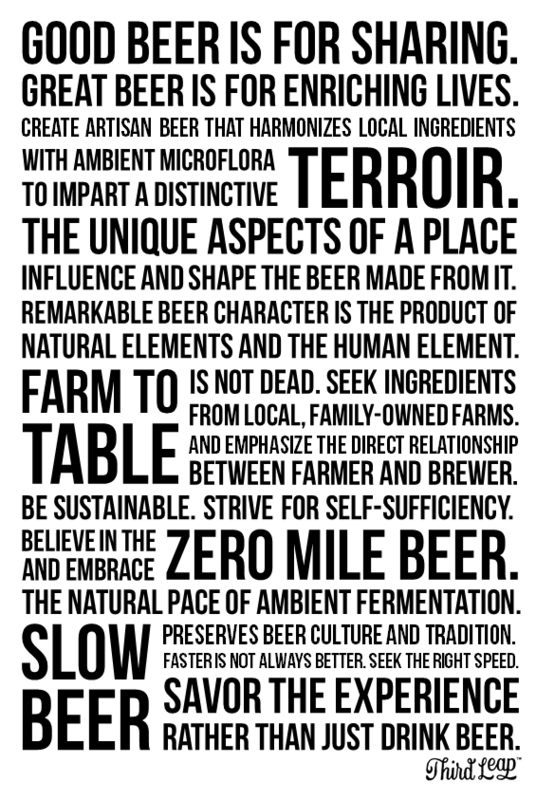 It is a daily reminder of the values we live and work toward as a homebrewery. A large component of beer’s allure is how it unites people. Beer brings people together for conversation, camaraderie, dinner, sports, etc. Beer is inherently social. In recent years, I have feverishly enjoyed the wine-ification of beer, particularly the shift to large format (22 oz and 750 ml) bottles. Today, some breweries (i.e Bruery Terreux) use only large format packaging to encourage sharing. The best beers are the ones we drink with friends. To celebrate the sharing of Third Leap beers, we have shifted to 500 ml corked and capped bottles. We love our Morning bottle shape and believe it contains the perfect volume for sharing. The cork evokes thoughts of wine while the crown proudly speaks beer. 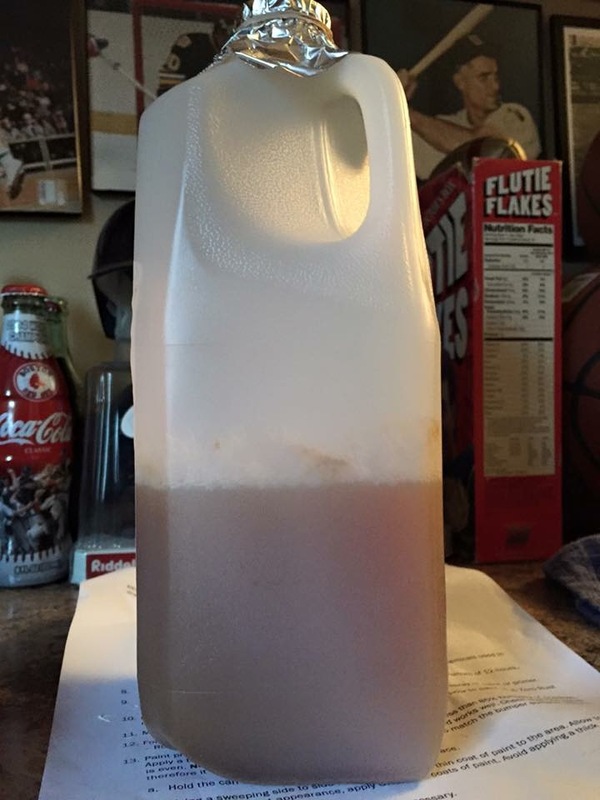 Most of our recipes have been fermented with foraged yeast that was isolated from a neglected half-gallon of unpasteurized Massachusetts apple cider. Our foraged yeast has been a workhorse; super attenuative, quick fermenting, and full of pome fruit and banana flavor/aromas. It can be used to produce consistent, predictable, farmhouse beers. Foraged yeast marks our beginnings. But ambient microflora marks our future. Our spontaneous beers are fermented with ambient yeast and bacteria found naturally in the outside air. They are noticeably more acidic, barnyard-y, and mineral-like. Beers fermented with ambient microflora are like a photograph – tied to a specific place and time, never to be exactly replicated. Terroir is more often associated with wine, coffee, and cheese than with beer. This innate character and sense of place has been mostly absent from modern beer due to homogenization of raw ingredients; malt comes from the Mountain West; hops come from the North West; yeast comes from the West Coast. But once-upon-a-time, beer was bursting with somewhereness. And we are committed to realizing this history. Idaho is rich in agriculture, consisting of nearly 25,000 farms and 12 million acres of farmland. While the top crop commodity is the potato, Idaho also produces a large amount of barley, wheat, and hops. And the Treasure Valley owes most of its excellent water supply to mountain melt-off. The ingredients for a 100% Idaho beer are literally all around us. At its core, farm to table celebrates knowing where your food/beverage comes from. It emphasizes the direct relationship between farmer and brewer. 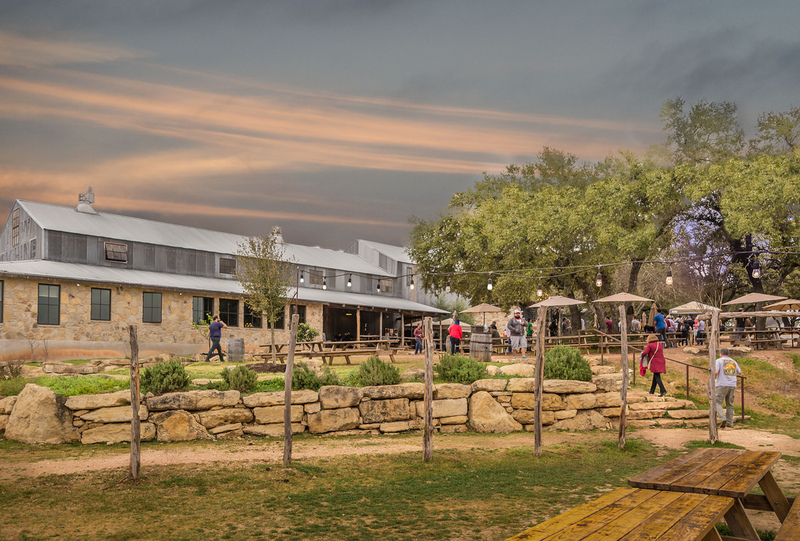 In its purest, most honest form, farm to table brewing means the beer is produced and served on the farm. This is exactly our long term goal and dream! For the short term, however, Third Leap will focus on direct-sourcing Idaho ingredients for use in our beers. This effort will provide environmentally sustainable beer that positively impacts local farmers. We strongly believe in beer traceability – that’s why we proudly state the origin of our beer ingredients for easy identification. Similar to food mileage, beer mileage is a way of attempting to measure how far raw ingredients have traveled before reaching the brewer and, in turn, how far the beer travels before it reaches the consumer. It is one method of looking at the environmental impact of beer and its ingredients. In Massachusetts, I took gradual steps toward reducing my beer miles to zero by using homegrown hops, spontaneous fermentation, and raw well water for some of my beers. Relocating to Idaho has put this pursuit on hiatus, but I fully intend to restart this initiative over the next few years to include homegrown/malted barley. I look forward to the day Third Leap can be truly self-sufficient by using 100% estate grown/sourced ingredients and spontaneous fermentation to produce every beer. 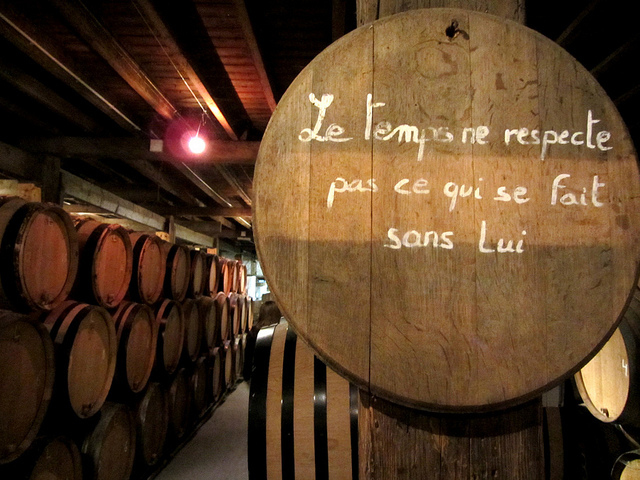 Buried among endless lambic barrels at Cantillon, there is a small, aged sign that reads “time does not respect that which is done without it.” It is a short yet incredible statement. Long ago, arguably the most important ingredient in beer was time. Ancient beers required ample time to develop complex flavors and soften green edges. We greatly appreciate the history of these beers and the patient brewers who produced them. Fermentation by ambient microflora is slow; it proceeds at its own, natural pace. Brewers must savor months and years rather than just count them. Ambient fermentation is about doing things as well as possible, instead of as fast as possible. We embrace slow beer – time is a vital ingredient in every beer we produce. Beer is less of a beverage than an experience. Thoughtfully composed beer has the ability to take you on a sensory journey. It is a living, evolving thing made, not only of barley, hops, water, and yeast, but of people and a place. Beer has the power to make a conversation an interaction, a meal an occasion, a day more memorable. We believe good beer is a wholesome experience, one we encourage people to have when drinking. What do you think of our new manifesto? Share your comments below!